The crime branch of city police, with the help of Morigaon police, rescued Mrinmoy Kakati (19), a student of a city-based private college on Tuesday night from Karbi Anglong, who was missing since the morning of April 18. The police also arrested three persons involved in the kidnapping. The arrested were later identified as Moti Deuri, Romen Konwar and Jiten Inghi. On April 20, Mrinomoy's family registered a kidnapping case at the Odalbakra police outpost here after the boy did not return home. Though initially the boy was suspected of running away from house, the family later confirmed that he had been abducted and they had received a ransom call from the abductors. The kidnappers demanded Rs 50 lakh as ransom money, which the family refused to give. Mrinomoy's father, S R Kakoti, is an employee of the Rural Electrification Programme scheme. A source spotted Mrinomoy in Jorabat and informed the police. "Our sources said that the boy was taken towards Nellie in Morigaon district and our search team rescued him from a cave in hills located in the bordering areas of Morigaon and Karbi Anglong districts," said additional SP (crime) A Sinha. 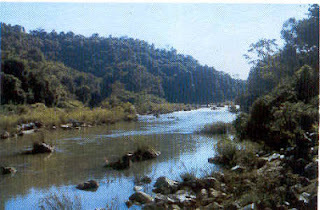 Mrinomoy was kept in a cave in the hills of Marlak area under Baithalangshu PS in Karbi Anglong, some 25 km from Nellie. After being rescued, the boy said: "I've known Moti Deuri for some time now. He was taking me to Karbi Anglong to see some broom samples as we were planning to start a business. On the way, two people in dressed in camouflage emerged from the jungle and snatched my bike and took me to the cave. They threatened me with a machete and a dagger." According to police, the boy was lured by Deuri, who used to be the driver of Mrinomoy's neighbour. "Moti Deuri is one of the planners of the kidnapping. He lured the boy in the name of broom business," added Sinha. Though the involvement of Karbi Anglong-based militants was initially suspected in the case, police denied any such links. "We found camouflage jackets from the rescue spot but this doesn't indicate any link to any rebel outfits. It is a criminal case," he added. The crime branch on Tuesday night also succeeded in catching two kingpins in the dacoity case that occurred in Beltola and Gorchuk areas last week.